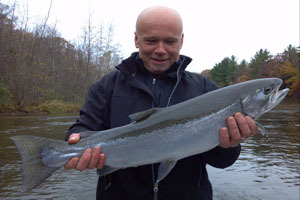 Located in the middle of Michigan's 100 mile Century Circle, which has some of the best Salmon, Trout and Steelhead fishing in the lower 48 states. 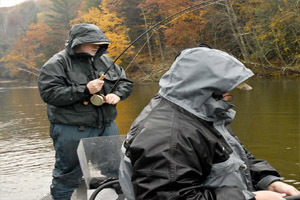 I invite you to share the fly fishing and learning experience within this circle. 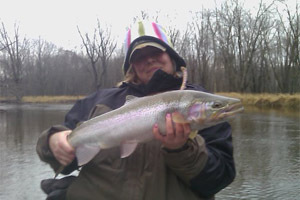 The Big Manistee offers superb runs of Salmon and Steelhead, with an existing Trout fishery below Tippy Dam. 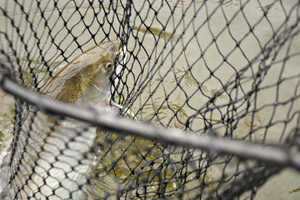 Flyfishing the lower sections in the fall for Steelhead can offer some exceptional days. 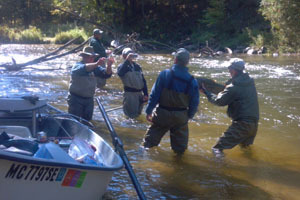 The Pere Marquette offers a unique year round fishery without a dam. 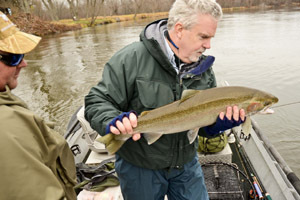 The Catch and Release section downstream from M-37 offers some of the best Trout, Salmon, and Steelhead fishing in the Century Circle. We fish all water between M-37 and Scottville, depending on the season. 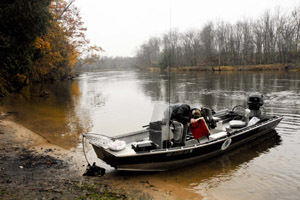 The Muskegon River is a tailwater fishery that is constantly changing due to stabilization of the flows of Croton Dam near Newago. 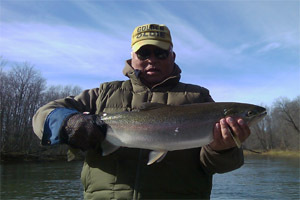 It offers a year round fishery for trout, with excellent runs of migratory Salmon and Steelhead. We fish the White River downstream from Hysperia primarily for migratory Salmon and Steelhead. Because of it's smaller size it is often the first river to turn on in the Spring for Steelhead. We use Sink Tip Lines with marabou spey flies or weighted shooting lines tipped with egg flies and nymphs to target the "mini tarpon" of the Midwest. 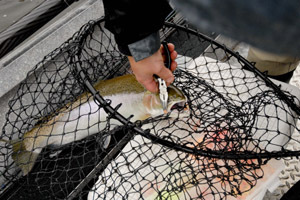 Fall is the time of year that steelhead are most aggressive and actively feeding. 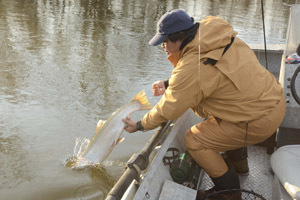 Fish are most aggressive in early October when water temperatures are the most favorable, but can be caught in the worst weather conditions all winter long. A great thing about Winter is there is virtually no pressure from other fishermen. 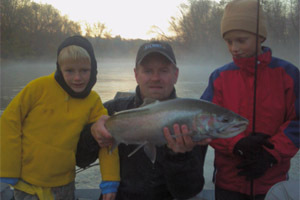 Trips typically start early in the early morning for Fall steelies, and later as the colder weather hits. 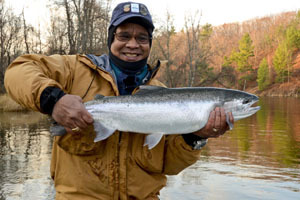 Steelhead begin their spawning activity as soon as the water hits 42 degrees. Smaller watersheds like the Pere Marquette or White Rivers warm first. 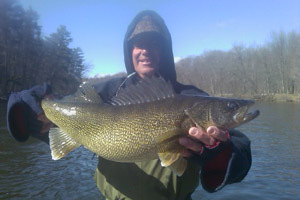 Look for spawning activity to peak in late March on the smaller rivers and in late April on the bigger tail water fisheries like the Muskegon or Big Manistee. 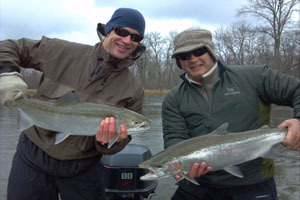 Late steelhead season offers some excellent trout fishing with streamers between steelhead spots. 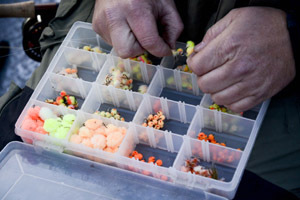 Trips start in the morning and will start earlier as the angling pressure permits. This time period offers some excellent streamer fishing during the Salmon smolt out migration, where we fish sink tip lines and minnow imitations to catch bigger fish that will not become insect oriented until the peak of the dry fly season. 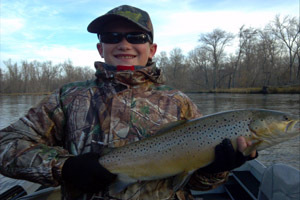 Streamer fishing is the most productive method in Michigan to catch large trout on a regular basis all day long. 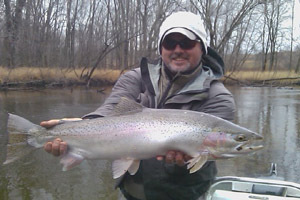 On some occasions we catch drop back Steelhead are feeding heavily in the pools on the way back to Lake Michigan. Typical start time 8am. 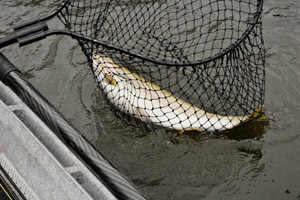 Salmon enter the rivers as early as late June on some of the rivers in West Michigan but mid August offers more consistent fishing as the water temperatures cool down. 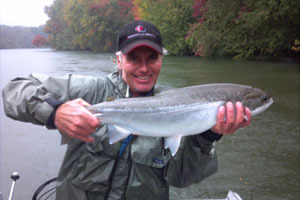 From Mid August to Early September we occasionally use heavy spinning tackle and cast large spinners for the Salmon. 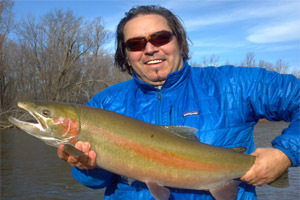 Salmon are used to feeding on Aielwives and smelt (baitfish) in Lake Michigan and do not always respond well to flies. We also will fly fish sinking lines and larger streamer patterns to early Kings, but do not have the results of spinners. Fish respond well to flies in early September when the water cools down more and they become more aggressive before and during spawning. typical start time 7am. Grey Drake and Hexigenia hatches are the main trout fare! After they are over and the summer is in full swing, we can have daytime dry fly fishing with a variety of terrestrial patterns. 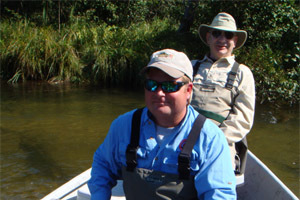 Use of Orvis or Sage fly rods and tackle,Â flies will be added to your bill after fishing. You may specify choice of grilled lunch: chicken breast, steak, or wild game. All served with potato and vegetable. Soft drinks are also included. Kids lunches will include lots of candy and hot dogs upon request. Full day trips are 8 hours on the water. Half day trips average 5 hours start to finish. PLEASE INCLUDE YOUR DESIRED DATE IN THE NOTES SECTION OF THE PAYPAL FORM. A $150 deposit is required for all trips. Weather conditions causing cancellation are at the Captains discretion- the deposit will be refunded or the trip date will be changed based on availability. If you cancel within 15 days we expect full payment for the trip. Some Action Shots From The Rivers.